Jeff Stai’s (El Jefe to those that know him) Twisted Oak Winery produces some of my favorite wines created with an Iberian feel from old vines (grown in California) of some of the greatest varietals of Spain and Portugal. 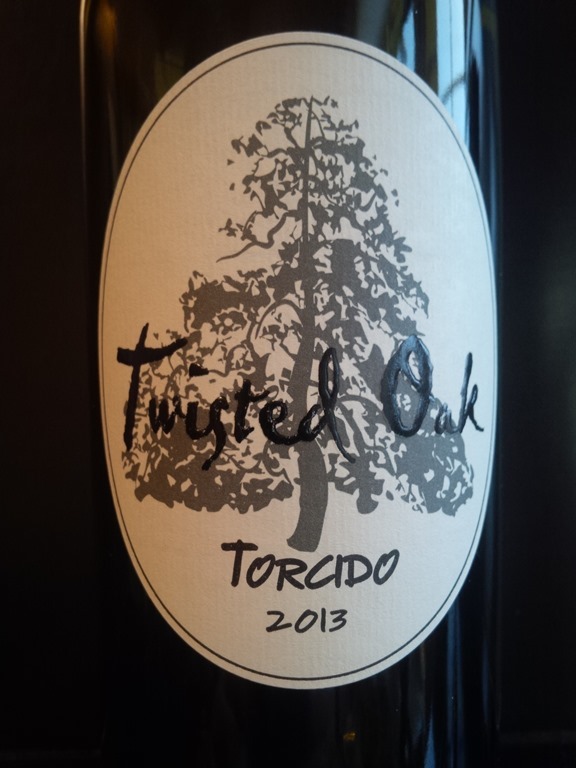 This Weekly Wine, his 2013 “Torcido” proved no exception and nothing short of spectacular. This wine comes from Grenache grapes produced in Calaveras County County California. My re-post yesterday of a 2014 blog by Jeff about his dog Nacha, provides great insight in to Jeff and his approach to life and wine. Twisted Oak Winery not only produces wine, but as one of my friends described it on a concert day “an adults only (because of the wine) theme park”. The concerts there – stuff of legends – render memories of the days of Woodstock but with wine . A quick tour of the Twisted Oak website dem onstrates just how it operates. Like every winery website it has wine clubs, wines to order, and stuff to buy, but it’ how it’s presented and what you can get there that stops you in your tracks. Yes I am a proud owner of a genuine Twisted Oak Rubber Chicken which I display proudly in my wine room amongst all my assorted wine gadgets, bottles and glassware. As my tasting notes and review discloses;Torcido’s black cherry and smoke nose right out of the bottle defines it as a near perfect example of a superbly crafted Grenache Jeff never sells a wine before it’s time and this 2013 proves the rule, it drinks well right now and has many good years left in it if cellared properly. Sadly it will not last much longer in my cellar as I find it hard to make it through a month without getting my El Jefe fix. This entry was posted in Craft Wines, Grenache, Hodgpodge, Jeff Stai, Life Balance, Wine, Wine Buying, Wine Making, Wine Photos, Winemakers, Wines, Words and tagged California, experience, grapes into wine, Grenache, Jeff Stai, Life Balance, the modern world, Twisted Oak, Wine, wine industry, Wine Varieties. Bookmark the permalink. I’d love to see a picture of you in your suit with your rubber chicken. Time for a new profile picture? “Woodstock, but with wine.” Was there something else going on there?!? Now that I am retired, its flannel shirt and blue jeans. Well I was lead to believe that there might have been some extra curricular substances at Woodstock, by I’m not sure, and certainly didn’t see any.